MyPlate, MyState – You Asked It! 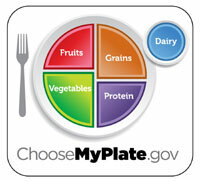 The newest tool in MyPlate, MyWins is MyPlate, MyState. It asks you: What foods, flavors, and recipes is your state/territory known for, and how do they fit into your healthy eating style? The Rapid Response Center was formed in 1995 as a resource for Kansas State University Research & Extension Agents. Resource topics included Food Science, Human Nutrition, Food Service, Textiles, Home Care and other consumer topics. Since that time, the Center has grown to be of valuable assistance to Kansas State University Extension Specialists in those areas.